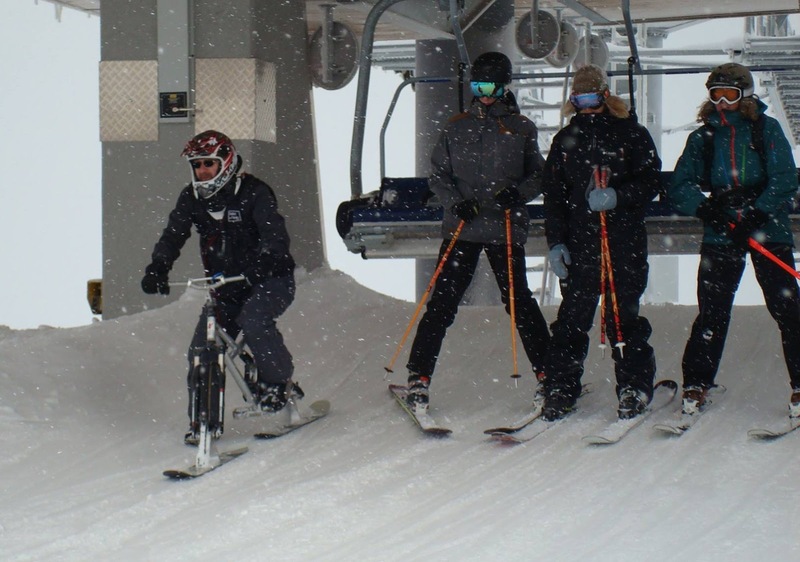 There is also the issue of perception by the ski lift operators. Ski biking in France recently I found many of the lifties automatically slowed the lift when they saw me. At the bottom and even more so at the top. I did not ask for or indeed need or want this. This is another sure fire way to annoy other mountain users. Having worked 2 seasons as a liftie I know bosses listen to liftie gossip, if they hear the lifts are constantly being slowed or stopped for skibikers it will not help the skibike cause. Though you did not go as deeply into the middle point of the three key challenges - it is an observation close to me. My Dad is indeed an ageing rocker. At 70 I am proud to say he absolutely shreds on a snowboard (which he took up at 55). His knees are in appalling condition and I know the boarding causes him high levels of pain (though he never complains). So he is a perfect skibike candidate… though it’s still going to take a fair bit of convincing to get him to try one. What an interesting, constructive, objective article and it confirms many of my own thoughts and experiences. I've watched and read with interest the "footskis" v "Pegger" debate and the two different styles that fall under these banners, more commonly known as Skibobs and Skibikes. Going back 15 years when I first discovered the Brenter (Skibob) models, we seemed to be the only ones out there shouting from the rooftops that there really was an alternative to skiing and snowboarding! But as Wayne so eloquently points out, it’s not going to be any easy ride for everyone. Re: Point 3 - Whilst in Austria our skibob style bikes are allowed everywhere on anything (and it now seems that the resistant Italians have finally accepted them too) mainly due to heavy marketing by Brenter, rental stations at major resorts, wearing footskis and an open-minded attitude to “adaptive” type products for the less abled, the general skiing public are not so all-embracing! We are obliged to sit at the ends of chair lift seats as the bikes length from tip to tail means that we take up less room if the tails extend out past the chair end. The design is such that the bike has to be lifted and placed across the knees. Up to that point all is the same as being a skier, the bike is narrow enough to be stood at the side of you as you pass through the last swing-arm gates (and the bike acts as useful crutch when the moving floor propels you forward then stops abruptly!) and they nice and light to lift. The issue is that on a 6 seater chair, we obviously have to share the space with other passengers and they have little understanding of the fact that the security bar cannot be fully lowered for them to use the footrests, because this would force the bikes into our thighs. They are not happy about this, feeling they have been short-changed an opportunity to rest their legs! We have tried to deter others accompanying us, but as usual, the panic to get back up the mountain as fast as possible means there is little chance of them waiting 10 seconds for the next chair and I do understand that it’s unreasonable to expect a piece of machinery designed for the uptake of 6, to be occupied by only 2, especially when it’s high season and there are queues! Small gondolas that usually carry 8 or 10 people: Here we score quite well with the Brenters. On the newer models the front ski moves backwards (disengaging from the bottom of front fork) almost halving the overall length, this means we can stand the bikes upwards their tails and have them in front of our knees on the benches, taking up very little space. We make sure we are first on to get them in postion, so last off. We have had instances where the space is limited and skiers having already put their skis in the outside holders, then discover there is no room for them inside the cabin, panic ensues in case their skis then go off up the mountain without them but we cannot account for those that don’t pop their head in the cabin first to see if there any seats free! To summarise, I think Brenter and their team have tried their best to make the transport of their Skibobs as practical as possible, causing as little disruption to other lift users as possible, but in doing so I have to accept that design compromises have been made to achieve this. They are no competition for the Stalmach range of Skibobs, that are the Ferrari’s of the skibob world, but again, even on these, the skis have quick release fittings for easy lift transportation (but they are heavier and more cumbersome). These manufacturers have proven that it can be done; perhaps there has to be an acceptance in the Skibike world that performance compromises may need to be made, to facilitate acceptance and access to the uplift systems. 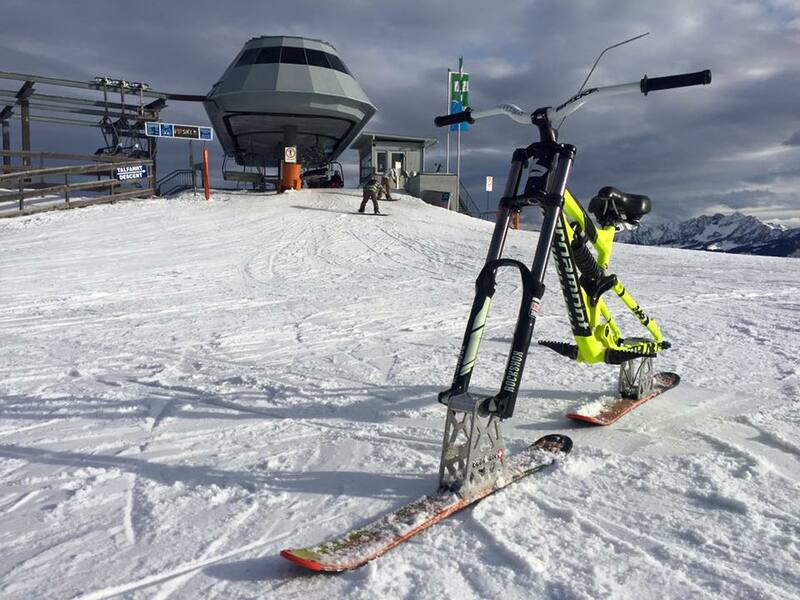 After all, there is no point in having a high specification Skibike if you can’t get it up the mountains! Thanks Sharon, that's some great feedback. In case you haven't seen it before there's a neat little video by Richard Platt which demonstrates how a skibob can be safely carried on the outside seat of a chairlift and not cause the problems you have described with the safety bar and crushed legs. I have adopted this method for my style of skibike, I just don't have the luxury of gliding off the chair so fluidly. In France you would have a leash to prevent any possibility of dropping the skibob or skibike off the chairlift. The type designed for kayaking are popular and inexpensive. Sharon, you valiantly try to condone the fact that you take additional space up on ski lifts and that other users are unable to close the safety bar let alone the plexiglass cover that protect the other users from the elements. Yes back in 1990 you may have been able to say that was OK, but in 2016 with increasingly costly lift passes, the other users expectations for their lift pass, is to use the lifts unhindered. We also face the increasingly common fact that on almost all new lifts, unless the safety bar can be locked down, the lift safety system wil prevent the departure of the chair, I presume that was due to the 2 young girls who slipped to their deaths last year from the Italian lift, due to them not lowering the safety bar correctly. So as much as I sympathise with your statement, Skibobs are just as much of a future problem as skibikes and unless we address those issues, then it is only a matter of time before we are limited to gondolas or more likely prevented from accessing the mountains. Thanks Mark, yes I've seen that YouTube demo and many more like it just to make sure we are using the best method and that is exactly how we do it, but we have not come across a chair lift like that in many years, the modern ones have a more sophisticated safety bar, that comes right down on your knees. Some videos show you taking your hands off the bike and swapping them to holding the bike from over the safety bar, then having to switch your hands back to holding underneath when the bar is about to be lifted. This I think is dangerous as you cannot determine when others on the chair lift might decide the lift the bar. We wait to the death, others like to lift it long before you should. And swapping the hands around that are holding the bike mid air would terrify me, even with a leash! The video clearly demonstrates the issue with the front ski encroaching on the adjacent seat/leg space and I can't see a way round this with this design Skibob. Wayne - I don't particularly condone it, I can't see a way round it. But I disagree with your predictions. 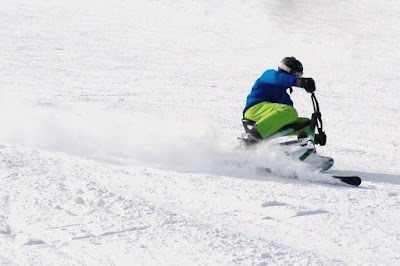 As Austrian resorts actively promote the use of Snowbikes, which now appear on their tourist websites as an alternative adaptive method of using the mountains and more and more hire stations are setting up, they are not going to be banned anytime soon! On the contrary, there has been a recent explosion in the use of them. We used to be a rare sight and hire stations few and far between, now there are in most major resorts and lessons are going on everyday, with groups of 20 at a time. We have to reserve our hire bikes months in advance of the holiday because there is such a high demand. Italy that had always banned them, has now opened the doors to them and is actively promoting them. We will just have to keep muddling along as best we can, just like skiers had to when snowboarders first arrived on the scene and were frowned upon as they shuffled along awkwardly and caused pile ups when they disembarked!